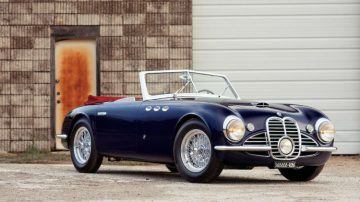 A 1951 Maserati A6G/2000 Spider by Frua sold for $2,755,000 as the top result at the Bonhams Scottsdale 2019 classic car auction. 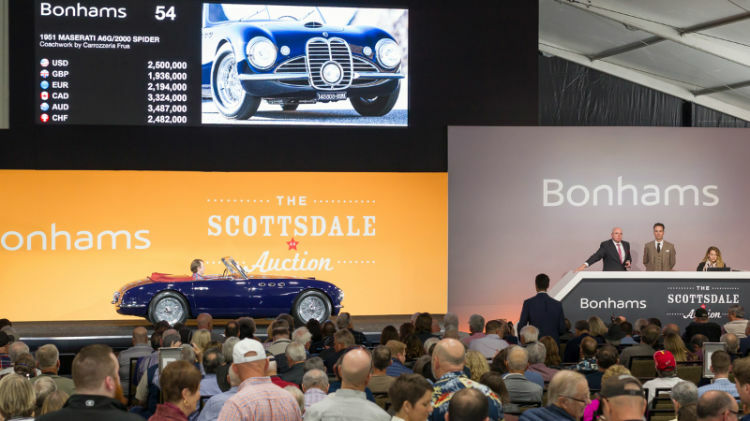 Only three cars sold for more than a million dollar at the Bonhams Scottsdale 2019 classic car sale: a 1951 Maserati A6G/200 Spider by Frua sold for $2,755,000, a 1955 Mercedes Benz 300 SL Gullwing for $1,110,000 (post-hammer) and a 1963 Porsche 365B Carrera 2 GS Cabriolet achieved $1,005,000. 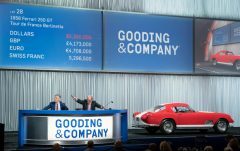 A further five cars attracted unsuccessful highest bids exceeding a million dollars, including a highest bid of $4 million for the 1954 Ferrari 500 Mondial Spider. The top result at the Bonhams Scottsdale 2019 sale was $2,755,000 for a 1951 Maserati A6G/2000 Spider, chassis 2017, with coachwork by Carrozzeria Frua. This spider is one of only three produced with coachwork by Frua on a shortened chassis. In all, only 16 of the A6G/2000 were produced: nine with bodywork by Pinin Farina, six by Frua and one by Vignale. The car was fully restored in recent years and fitted with the engine used by an A6GCS in the 1948 Mille Miglia. (The original 2017 engine is apparently installed in an A6 1500 in Italy.) The restored car was shown at the Concorso d’Eleganza Villa d’Este in 2006, Quail Concours in 2010, and Pebble Beach 2014. The 1955 Mercedes Benz 300 SL Gullwing initially failed to sell with a highest bid of $1,050,000 but it was later listed as sold at $1,100,000. This was a sensible deal. Although this car sports its original interior, buyers are spoiled for choice: three Gullwings and three Roadsters were available at the Scottsdale 2019 auctions and more at Paris a few weeks later. A similarly highly original Roadster at Worldwide Auctions sold for a fairly cheap $990,000 a day earlier. 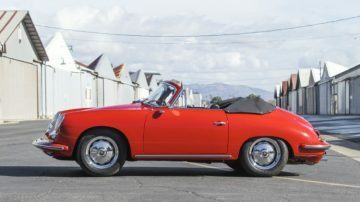 The 1963 Porsche 356B Carrera 2 GS Cabriolet was the only other car at the Bonhams Scottsdale 2018 sale to achieved a million dollar result when it sold for $1,005,000. This car is one of just 32 made. It is a highly original, matching-numbers example with the desirable four-cam engine. It has been in current ownership for 30 years. As Porsche’s top-of-the-line model when new, the Carrera 2 was the recipient of a host of factory improvements, including the first Porsche model to receive disc brakes. The price of the 1934 Mercedes Benz 500 K Four-Passenger Tourer has been moving backwards. 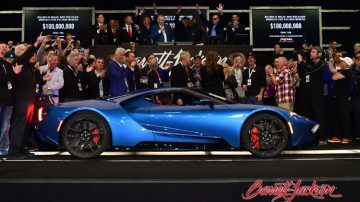 It sold for $830,000 at the Bonhams Scottsdale 2019 sale but at the peak of the market in 2015, a highest bid of $850,000 was no accepted at Amelia Island. In that auction, the car was still painted red and the pre-auction estimate $1.25 – $1.5 million. This 500 K is one of only eight made with right-hand drive for the British market (out of a total of 342 produced). It is believed to be the only 500K ever fitted with coachwork by Mayfair – it received the aluminum body that is still wears today in the late 1930s. Note: Highest bids as observed during auction. Some cars may have sold in post-hammer deals. 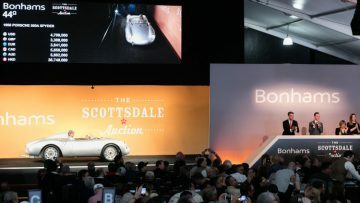 Bidding for the top cars that failed to sell at the Bonhams Scottsdale 2019 car sale generally stop 10% to 20% short of the lower estimates. While Hagerty reported healthy trading for cheaper classic cars at the Scottsdale auctions, there is clear hesitation by buyers to go near and above a million dollar, except for exceptional cars. 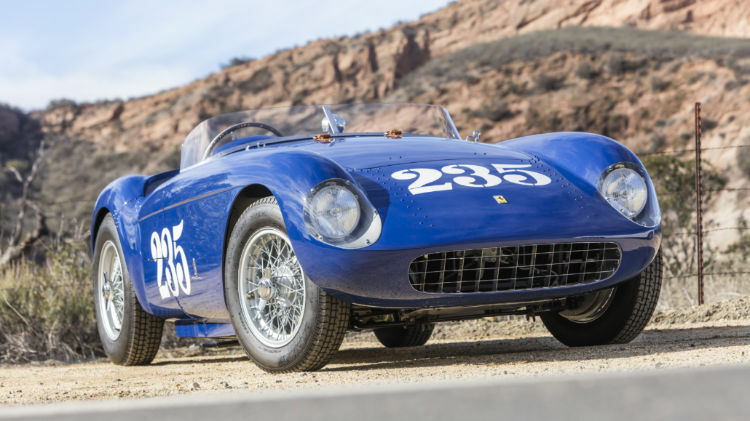 If the highest bid for the 1954 Ferrari 500 Mondial Series I Spider was accepted, the result would have been in line with the two achieved on similar models by Gooding in 2018: a Series 1 at Scottsdale for $4,455,000 and Series II for an even stronger $5,005,000 at Pebble Beach. Bidding for the 2018 Bugatti Chiron stopped more than half a million short of the highest bid Bonhams achieved for a Chiron at Quail Lodge 2018 and a million short of bidding at Mecum Kissimmee 2018. RM Sotheby’s has a Chiron at Paris 2019, as well as two Veyrons and a EB110. The 1993 Bugatti EB110 GT came so close to estimate, the seller may regret not taking the money.